The regional congenital anomaly registers in England had been registering congenital anomaly cases from as early as 1985 up until 31 March 2015. From 1 April 2015, NCARDRS took over the registration of new congenital anomaly cases for all of England. 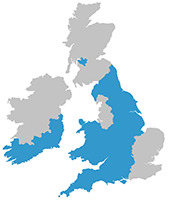 The historical BINOCAR data (up to March 2015) is in the process of being linked with HES, ONS and NPD data to produce a de-identified record-level research database of linked congenital anomaly outcomes (BINOCARD). Once created, BINOCARD can be accessed for research projects aiming to investigate the survival, health and educational outcomes of children born with congenital anomalies, subject to approval by the BINOCAR Management Committee and other criteria being met. The BINOCAR registers (and now NCARDRS) also shared anonymised case data with the EUROCAT central repository, which publishes data on the prevalence, key public health indicators and prenatal detection rates pooled together from its member registries. Aggregate data tables are available on the EUROCAT website, and researchers can additionally apply for anonymised case data for specific studies. See the EUROCAT section for further details. Other registers and networks may be able to assist with data sharing requests. Please click here for contact details.